Welcome to China! Our private English-speaking guide and driver will pick you up in time at the Beijing airport and transfer you safely to the hotel. A paper board with your name will be held high at the airport exit. The rest of the day is free at your own leisure. Beijing is among the top charming cities in China with its rich cultures. Today we do the sightseeing in Tiananmen Square, Forbidden City, Summer Palace and Silk Factory. Tiananmen Square: The largest city square in the world, a must-see for Beijing tourists. Forbidden City: A gorgeous palace of Chinese 24 emperors in different dynasties. Summer Palace: A good choice to relax your heart. It is a royal garden where emperors and their family had some entertainment or rest. Any tour is incomplete without reaching the Great Wall. Visit Badaling Great Wall in the morning. After lunch, do sightseeing in Ding Tomb, Cloisonne Factory, and Olympic Green. Badaling Great Wall: The most popular section of Great Wall, visited by Lady Thatcher and President Nixon and other celebrities. 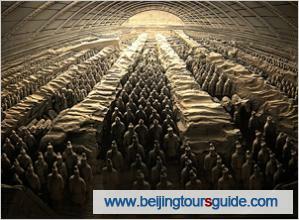 Ding Tomb: The most visited tomb of Ming Tombs which is the tomb cluster of Ming dynasty emperors. Explore the mysterious underground palace and appreciate the priceless relics. Olympic Green: Where you will pay an exterior visit to the marvelous Bird’s Nest and Water Cube. Have an interesting Hutong tour with rickshaw and visit the world famous Temple of Heaven. After lunch, fly to Xian. Pick you up at Xian airport and transfer to hotel; the rest of day is free at your own leisure. Hutong tour with rickshaw: No place is better to read the Old Beijing than in the Hutong, where old Beijingers lived and are still lived by local people. It is so meaningful to have a Hutong tour with rickshaw and drop in at a Hutong family. Temple of Heaven: Much bigger than the Forbidden City, it is where Chinese emperors prayed to Heaven for a good harvest. Today let’s begin to discover the ancient city-Xian, equally famed with Athens, Cairo and Rome. We are going to tour in Shaanxi Historical Museum, Xian City Wall, Big Wild Goose Pagoda, Gao’s Courtyard, and enjoy Shadow Play. Shaanxi Historical Museum: A large national museum built with the architectural features of the Tang Dynasty. The museum houses the best cultural heritage of Shaanxi Province and shows the systematic development process of Chinese civilization. Xian City Wall: One of the largest ancient military defensive systems in the world. Big Wild Goose Pagoda: A well-preserved Buddhist architecture which is the symbol of the old-line Xian. Gao’s Courtyard: The residence of GaoYuesong, a famous upright officer of Ming Dynasty Central Government. Enjoy the interesting Shadow Play in the quadrangle, so magic! Continue our tour in Xian by visiting the Terra cotta Warriors and Horses, Xian Art Pottery Factory, and Forest of Stone Steles Museum. 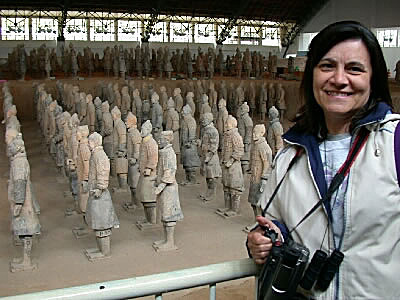 Terra cotta Warriors and Horses: One of the most significant archeological finds of the 20th century. These 6000 life-size painted terracotta warrior and horses were sculptured 2,200 years ago to protect the tomb of China’s first emperor- Qinshihuang. Xian Art Pottery Factory: you could see the copies and souvenirs of Terra cotta Warriors and Horses as well as Tang Tricolor. Forest of Stone Steles Museum: This museum boasts the largest collection of steles cut in 837 A.D., the oldest existing texts of the Confucian classics, and more than 2,000 engraved stone tablets from the Han dynasty. Be transferred to Xian airport and fly back to Beijing. Wish you a pleasant journey and thank you for using our service. * Hotels as listed in the itinerary. * High Season: April 1-October 31, Low Season: November 1-March 31. * If you need to prolong your stay in China, or arrive a few days earlier, please let us know and we’d be happy to extend your hotel bookings, or arrange additional tours for you. How much does the Superior/Dulux class tour cost? Request you to quote for 3adult on triple share room travelling from 19th Ocotober onwards for 7days. Looking for accommodation in 5star city centre hotel with all transfer & sightseeing on private basis as per your itinerary. Please give your best possibilities rate. Thanks for your message. Our travel advisor has been sent the email about tour prices to you, please check. If you have any questions please contact us. I would like to know more information about the 7 day Beijing/Xian tour. We are planning to travel the dates of April 20-27. Is it possible to include a one way bullet train ride in place of the flight? I look forward to your reply. Thank you. We will send the email to you right now. We want to join 7d Beijing Xian tour, we will arrive in Beijing 15 April, 2013 at 2:15 am and return from Beijing 21 April, 2013 at 2:30 pm, for 6 person adult. Please send me the best price that you can offer, Thanks.